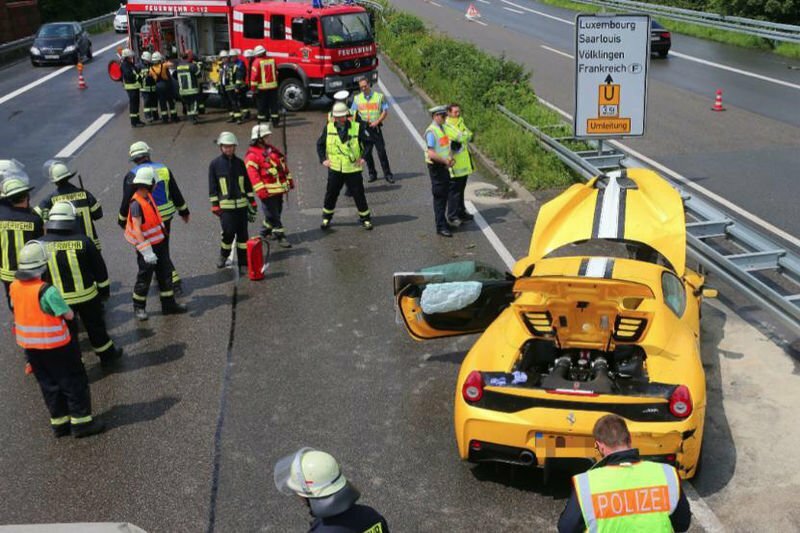 The Luxembourg driver (65) of the bright yellow Ferrari 458 Speciale Apertra was driving in the rain towards Neunkirchen when he lost control at high speed, between Saarbrücken and Merchweiler. The 458 Speciale A crashed into the guardrail, hurled back onto the road and came to a halt against the driving direction. The car looks pretty wrecked and with the Special Aperta being quite scarce and its value growing all the time, this was a VERY expensive mistake. This 1969 Ferrari Gtb/4 Daytona Is Worth 1.5 Million Pounds. Yes, Really! Video: Check Out This Modern-day Ferrari 288 Gto, It's Seriously Cool! Video: This Ferrari 328 Conciso Concept Looks...interesting! The Pristine 1994 Ferrari 333 Sp Will Make Your Childhood Memories Come True!